Thanks to Tom Wulff for his hours of work in translating it, changing images and artwork and laying it out. Thanks also to J.-E. Solheim and to Morten for providing cross checking suggestions and proof reads. Tom writes from Norway that there is a very active community of skeptics in Norway (indeed so far this year more than 1,000 Norwegians have visited this site alone, and all without a single word in Norwegian posted here until now). And other good news… the worldwide volunteer network expands, and before long there promises to be versions available in Turkish and Spanish as well. (Please speak up if you are a Spanish speaker and would like to help). The English version is here. 32 comments to Skeptikerens håndbok er her! Jeg kan ikke snakke norge, skønt jeg kan forstø. Anne Kit? Tusen takk til de som oversatte boken! I’m Norwegian on my mother’s side and I am proud to find that there is a burgeoning skeptics movement in Norway. Let’s hear from you here! Oh, Heavens that is not true Anne Kit. It was indeed, the Royal Danish Observatory that demonstrated, beyond question, that the orgin of the asymmetric and unremarkable Earthly warming over the period 1970-2000 was the result of solar variability, and uniquely. Perhaps they just want to believe the world is warming – for whatever reason. Man, it’s cold in Finland! I think Svensmark has been busy of late, trying to save the world from the mistake of using Greenland as a poster child of global warming. To hear unknowledgeable people speak of it, one would think Greenlanders practically bask on Sydney beaches throughout the year. To speak Norwegien, we say tht in Norw. as follows. Å snakke norsk. My fingers are not helpfull this morning. I am typing like a ??!! All good wishes to our friends in Norway! I am so glad we have sceptical friends all over the world. Hei Tom! Jeg er så glad å se dette bok oversettet, to uker før jeg reiser til Norge til å se mine fetteren. Håpes norsk er ikke få dårlig! Tom, I’ve been in touch with Tom Segalstad and others. Click on my name to see my work. Yeah at last I managed to get it ready for posting. Remarkable how close Norw. and Danish are – whereas Swedish is not terribly close to either of them. Finnish is it’s own entity, close only to Hungarian and then (at least to me) only vaguely, and neither are “Slavik” in any sense. Seven languages was it Brian? I have yet to get a translation of the Handbook that you can;t read (but I’m working on it). Lucy I have printed and read all 16 pages from your site. Interesting. You have collected a huge pile of info. Norw. and Danish is quit close. We the Norw. read and understand Swedish better than Danish, but Danish is closer to Norw. in writing. So, you think it’s a big picnic to be an idiot savant? Tom I can understand and speak Danish, I can understand Norw. but they don’t seem to understand me, and I can’t understand Igmar Bergman when he speaks at all! Ooooh, the Swedes and Norwegians aren’t going to like that comment, Brian There’s always been a great deal of internecine rivalry among the three Scandinavian nations. We like to beat each other at football (the REAL football game, or what you guys call “soccer” …), and the Swedes and Norwegians usually say that Danish is not a language, it’s a throat disease (actually, spoken Danish has more in common with guttural Dutch than either of the other two Scandi languages, which are both more melodious and sing-song). But when threatened from outside, we’re all brothers and sisters, ikke sant?. I don’t mind either way; I’m Danish on my father’s side and Norwegian on my mother’s, and my mother’s family has quite a bit of Swedish influence, so I love them all! You are both right. As said No. and Da. is closer in the written form, but we No. understand the Sw. better because of the fact from Anne-Kit. Vincent H Guerrini DVM, MSC, MSc, PhD (All science degrees though…if needed). Will need to do the ene over some of the n as in La Nina etc..accents etc….I think there is a site where they can be got… Lucia Liligjren (Rankexploits) seems she’s slowly becoming skeptical…. we hope hahahah. Of course there should be literally millions of guys/gals in the USA who could also do it. Hablo español también, Vicnete (Vincente? ), sobre tan bien como hablo inglés (y no todo el que fluido en eso). Deseo que hubiera más escepticismo entre los países de habla hispana, aunque parezca haber algo en el Continenet, en España y en Portugal. No tanto en las Américas. If you like, I can translate your “guide” in Dutch, German and Spanish. The Dutch and the Germans are in desperate need of a “Skeptic” push. There is hardly any opposition against the insane measures and useless spending of all kind to curb the future effects of Global Warming/Climate Change. the “imaginary” seven meters of sea level rise. This 50 billion Euro project already has started. Everybody is on so called “green electricity”, wind mill projects are build and Royal Dutch Shell is executing a carbon sequestration project for which they receive 250 million dollars in Government support. In Germany similar “Green Madness” is observed. There are hardly any Dutch or German skeptic blogs and those promoting the “Green Dreams” don’t allow skeptic remarks. The people here show an unhealthy trust in Government and support WWF and Greenpeace en mass. Fortunately the most Dutch are multi lingual so referring to English written blogs is not a problem but the Germans are more isolated. Anyhow, I think it important to make the effort and inform the people and stimulate them to start using that stuff between their ears again. You can contact via e-mail if you think I can be helpfull. Aber wir haben bereits eine Übersetzung auf Deutsch! Hi! Nice to see the Sceptics Handbook translated into Norwegian (which I can read perfectly well; I’m Swedish BTW). I hope someone will translate it into Swedish. There is an active and growing anti-AGW movement in Sweden. 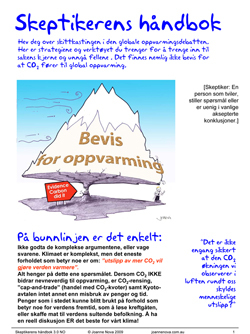 Groups like Stockholmsinitiativet (http://stockholmsinitiativet.se/), and sites like Moderna Myter (http://www.moderna-myter.se) and The Climate Scam (http://www.theclimatescam.se/) – and there are many more. Norwegians and Swedes have it easiests to understand each other, language-wise. Something like 95% of the words are similar (or identical), and the percent of the words that aren’t, will be something a person easily learns (newspaper is “avis” in Norwegian, “tidning” in Swedish; city is “by” in Norwegian, “stad” in Swedish, etc).